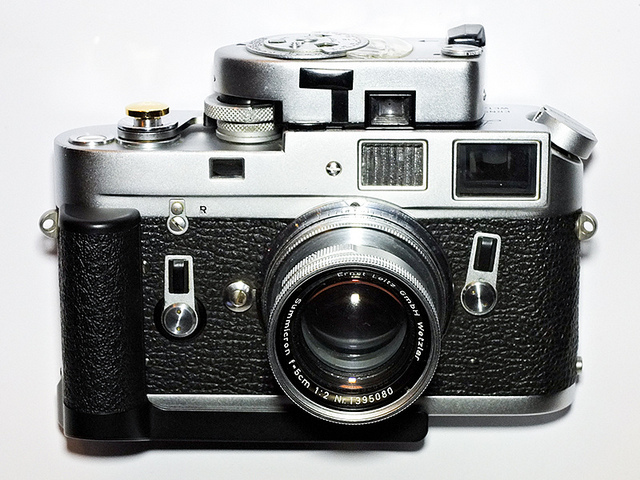 The MR4 meter is a reflected light meter that couples to the shutter speeed dial of many M cameras. It has a sensitivity range of EV +2 to +18. That means with a film of ISO 100 It will give you readings from F1.4 @ 2 seconds to F16 @ 1/1,000th of a second. That covers pretty much of what most people need in many circumstances. Once you attach it to the M3 it will read an angle of view more or less equal to the angle of view of a 90mm lens. This is the angle of view shown by the frame lines either when you insert a 90mm lens into the camera & attach it or when you push the lever under the large, clear viewfinder window in the front of the camera inward in the direction of the center of the camera. Until that lever stops moving. Regardless of the lens mounted. Unless the lens has permanently attached “goggles”. If the lens on the camera has permanently attached “goggles”: Push that same lever outwards until it stops & use the 135mm frame. Sounds silly but it works correctly. Replacement Wein 1.35 volt zinc-air “button” batteries are available. Just check in any camera store or find them on the net. First set the shutter speed on the camera to “B”. Then pull out the film advance lever to the “stand off” position. Then rotate the dial of the MR4 meter to “B”. Then slightly lift up the shutter speed dial on the meter until it stops. Then rotate that dial in the direction of longer exposures,ie: 120 seconds..
Then slide the meter into the accessory shoe. Then rotate the shutter speed wheel on the meter back to “B”. The wheel should now click down & the pin on the underside of the meter’s shutter speed wheel should drop into the little cutout between the “2” for 1/2 second & the either “4” for 1/4 second or “5” for 1/5 second. Depending on which model of M3 you have. Look to see if everything engaged properly. If all is right you are ready to go. A meter coupled to the shutter speed dial means: You only have to set the aperture after you make a reading. Unless the shutter speed set before you took the reading is not appropriate. Very fast & handy. 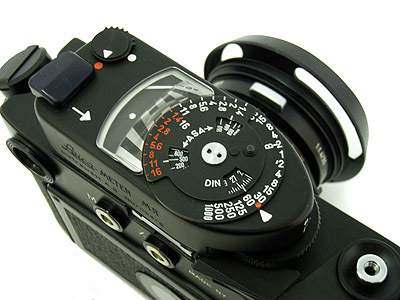 Alternatively, you can take a meter reading, then rotate the shutter speed dial until the aperture you want to use is aligned with the indicator arm. The shutter speed has also been correctly set for the proper exposure. Whichever works in whatever direction is equally fine. There is also a “battery check” slide on the front of the meter. If the meter arm goes up to or slightly passes the white dot: The battery is OK. The battery currently in the meter may still be OK even if it is years old. If these types of batteries are not used frequently they usually still last for many years. Often the meter will rub against the top of the camera and leave permanent scratches. This can be avoided by turning the appropriate leveling adjustment screws on the bottom of the meter’s mounting shoe. There are 5 screws holding the foot to the meter, 2 small ones & 3 larger ones. If you look from the back of the camera, as you try to slide the meter into the accessory shoe, you can see if the screws need adjusting. There should be a clearance of about 1&1/2 mm. The 2 tiny screws lift & balance the meter above the accessory shoe & the 3 larger screws lock the shoe & hold it in place. Like a tripod. A little fiddling with the 5 screws as per above, if necessary, should set the clearance so the meter clears the top plate by about 1&1/2 mm while still allowing the pin to drop into the slot in the shutter speed dial on the camera when the shutter speed wheel is returned from somewhere in the 4 seconds thru 120 seconds range to the “B” position. Once the pin drops down at the “B” position the shutter speed dial should be rotated to all positions to make sure that the pin continues to engage the slot & does not slip out between any of the the settings “B” thru “1000”. 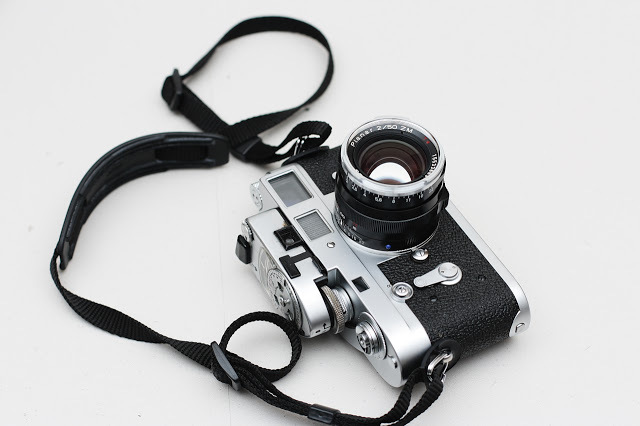 This entry was posted in Cameras, Leica, Leica Camera, Leica Rangefinder, Uncategorized and tagged Leica M4, Leica MR4, Leicameter, MR4 meter on June 22, 2014 by Leicaphila.